As a bit of an NPR junkie, you might be able to imagine that the musical offshoot, NPR Music’s All Song Considered is an even bigger addiction for me. If you are not familiar with it, come on, climb out from underneath that rock friend. As a designer, I’m always interested in how things are put together, and more specifically as a rock poster designer, well, of course I listen to what is likely an ungodly amount of music, all day, and sometimes all night long. So the gigantic culling breadth of All Song Considered and it’s amazing way of finding and showcasing music, bands and process makes it just about one of my favorite stops to park on the web. A recent addition to All Song’s Considered’s list of Studio Sessions site is this live show by the Brooklyn-based band Au Revoir Simone at the KEXP studios in Seattle, WA. Being fans of both the incredible work of KEXP and Au Revoir Simone for quite some time now, it was one of those “Awww yay!” moments when I came across it. 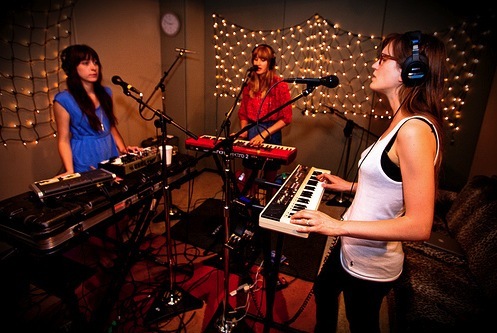 More photos from Au Revoir Simone‘s live session at KEXP are here on KEXP’s Flickr page. Hope that you dig it too! This entry was posted in Stuff I Like, What I'm listening to and tagged all songs considered, au revoir simone, kexp, kexp seattle, live music, live studio sessions, music, NPR by strawberryluna. Bookmark the permalink.